Silvopasture (Latin, silva forest) is the practice of integrating trees, forage, and the grazing of domesticated animals in a mutually beneficial way. It utilizes the principles of managed grazing, and it is one of several distinct forms of agroforestry. Properly-managed silvopasture can increase overall productivity and long-term income due to the simultaneous production of tree crops, forage, and livestock, and can provide environmental benefits such as carbon sequestration. Silvopasture is one of the oldest known forms of agriculture, and has been practiced in many parts of the world for centuries. Silvopasture is not the same as unmanaged grazing in woodlands, which has many known negative environmental consequences. Wood pasture in winter in the Wisentgehege Springe game park near Springe, Hanover, Germany. Fruit and nut and silvopasture systems covered large portions of central Europe until the 20th century, and are still-widespread in some areas. Wood pasture, one of the oldest land-use practices in human history, is a historical European land management system in which open woodland provided shelter and forage for grazing animals, particularly sheep and cattle, as well as woodland products such as timber for construction and fuel, coppiced stems for wattle and charcoal making and pollarded poles. Since Roman times, pigs have been released into beech and oak woodlands to feed on the acorn and beech mast, and into fruit orchards to eat fallen fruit. Silvopasture can be established by planting trees into existing pasture or by establishing pasture in existing woodland. These two establishment methods differ significantly. Planting trees into existing pasture presents several challenges: young trees must be protected from livestock, trees may take years to become productive (depending on the species), and planting trees in a pasture can limit the ability to use that land for other purposes in the future. Integrating pasture into existing woodland presents challenges as well: the woodland likely needs to be thinned to increase light infiltration, which is time consuming and may require heavy machinery, as well as a strategy for dealing with felled trees. Thinned woodlands are also likely to experience a flush of growth in weeds and seedling trees that must be dealt with to prevent the pasture from being overgrown. Pasture forages may also need to be seeded beneath the trees, a process which can be difficult if trees have already been felled. A primary benefit of silvopasture is increased farmland utilization - silvopasture can incorporate unused woodlands into production and produce multiple products on the same acreage. This diversifies farm income sources and increases farm viability. Silvopasture has been found to increase wildlife abundance and diversity and to contribute to carbon sequestration and climate change mitigation. Trees in silvopasture systems provide livestock with protection from sun and wind, which can increase animal comfort and improve production. Trees can provide shade in the summer and windbreaks in the winter, allowing livestock to moderate their own temperature. Certain tree types can also serve as fodder for livestock. Trees may produce fruit or nuts that can be eaten by livestock while still on the tree or after they have fallen. The leaves of trees may serve as forage as well, and silvopasture managers can utilize trees as forage by felling the tree so that it can be eaten by livestock, or by using coppicing or pollarding to encourage leaf growth where it is accessible to livestock. Well-managed silvopasture systems can produce as much forage as open-pasture systems under the right circumstances. Silvopasture systems have also been observed to produce forage of higher nutritive quality than non-silvopasture forage under certain conditions. Increased forage availability has been observed in silvopasture systems compared to open-pasture systems under drought conditions, where the combination of shade from trees and water uptake from tree roots may reduce drought impacts. Silvopasture is compatible with fruit, nut, and timber production. Grazing can serve as a cost-effective vegetation and weed control method. Silvopasture can also help reduce pests and disease in orchards - when introduced into an orchard after harvest, livestock are able to consume unharvested fruits, preventing pests and diseases from spreading via these unharvested fruits. 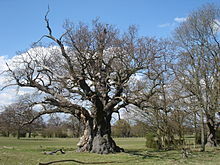 Veteran pollard oak, a sign of ancient wood pasture at Windsor. Tree species and planting densities are studied over a range of sites at The Silvopastoral National Network Experiment. Natural England's Environmental Stewardship scheme defines Wood Pasture, in the Farm Environmental Plan booklet, as a structure of open grown or high-forest in a matrix of grazed-grassland, heathland, and/or woodland floras. Their experience shows sheep use the trees for shelter from wind. This could provide significant animal-welfare benefits. However, 'sheep time' close to trees results in soil compaction with the greatest-compaction after trees are planted at very-low densities. Some botanists recommend trees be planted at no-less than 400 per hectare to ensure good-establishment. Evidence of old wood-pasture management is detectable in many of the ancient woodlands of Scotland, such as Rassal Ashwood in Ross-shire, and at Glen Finglas in the Trossachs. The Dalkeith Old Wood, belonging to the Duke of Buccleuch, cattle grazing beneath ancient oak, is designated as a Site of Special Scientific Interest (SSSI)  (or 'SSSI'). Ancient pollard oaks with a couple sweet chestnuts in western Berkshire's Aldermaston Court's derelict wood pasture. Silvopastures are the most-viable and prominent agroforestry practice in the United States. ^ a b c d e f g h 1982-, Gabriel, Steve,. Silvopasture : a guide to managing grazing animals, forage crops, and trees in a temperate farm ecosystem. White River Junction, Vermont. ISBN 9781603587310. OCLC 1020304962. ^ Wilson, Matthew; Lovell, Sarah (2016-06-18). "Agroforestry—The Next Step in Sustainable and Resilient Agriculture". Sustainability. 8 (6): 574. doi:10.3390/su8060574. ISSN 2071-1050. ^ "Silvopasture". National Agroforestry Center. National Agroforestry Center. 10 April 2015. ^ a b c Wolfe, Martin S.; Pearce, Bruce D.; Smith, Jo (December 2012). "A European perspective for developing modern multifunctional agroforestry systems for sustainable intensification". Renewable Agriculture and Food Systems. 27 (4): 323–332. doi:10.1017/S1742170511000597. ISSN 1742-1713. ^ Forum, The Farm Woodland. "The Farm Woodland Forum - Silvopastoral National Network Experiment". www.agroforestry.ac.uk. ^ a b Stiven, Roland; Holl, Kate (2004). Wood Pasture. Perth, UK: Scottish Natural Heritage. ISBN 1853973866. Wikimedia Commons has media related to Wood pasture. This page was last edited on 24 March 2019, at 19:50 (UTC).